Directions: Place powder in a glass or mug; add 2-3 oz. of hot water. Let it fizz, then stir until dissolved. Fill with warm or cold water and enjoy. You can also simply add Natural Calm to a glass or bottle of cold water. Award-winning Natural Calm from Natural Vitality is the best-selling ionic magnesium supplement in the natural products market. It is a relaxing magnesium supplement that mixes up into a great tasting beverage for easy delivery. It helps balance your calcium intake and restore healthy magnesium levels. For best results, divide your daily amount of Natural Calm into two servings. Natural Calm can be taken with or without food. 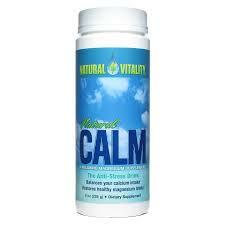 Natural Vitality Natural Calm Anti-Stress Drink balances your calcium intake. Calcium is an important mineral, but too much is not good either. Natural Calm balances these minerals and restores healthy magnesium levels. It is a required cofactor for an estimated 300 enzymes. Among the reactions catalyzed by these enzymes are fatty acid synthesis, protein synthesis, and glucose metabolism. Magnesium status is also important for regulation of calcium balance through its effects on the parathyroid gland. Serving Size: Individual needs may vary. Start with one half teaspoon (1 g) daily and gradually increase to 2 slightly rounded teaspoon (4.5 g) as needed.